The Town of Carefree is partnering with the Desert Foothills YMCA during the Christmas in Carefree event to help support Teen Leadership programs by selling Luminaria bags for $10. 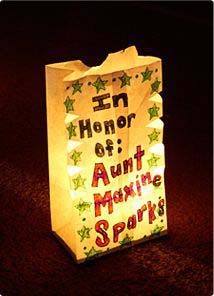 Purchasers will be able to decorate their bags to celebrate a cherished memory or the life of a loved one and the decorated bags will be displayed and lit in the Carefree Desert Gardens Dec. 15 – 24. Part of the proceeds is earmarked for the Teen Leaders program at the YMCA, providing opportunities for youth to realize who they are and what they are capable of achieving through academic enrichment, confidence building, goal setting and much more. Contact the Desert Foothills YMCA or go online at ChristmasinCarefree.com. A complete line-up of events is TBA.